Beautiful! Cool logo by H2O, great tune (by who? ), nice sine-twisters (hardwired 4'ever!) and code. Small size rulez! This month is a legend's cracktro come back one =). Thumbs up GNS! (and TRSI for the crack intro). Good work Hitchhikr! thats what i call a good windows cracktro! there is no a500 flow, but is ok.
nice one, but the logo somehow looks cheap and well...music doesn't really fit imho. anyone else get long pauses in the effects? Phoenix: there is random delays between explosions. H2o did the gfxs and the design, the music is from estrayk (i didn't know it but it's quite good, imho). I'm just the code-slave here ;) (only the balls and the exit-with-left-mousebutton were of my initiative). a friend had similar troubles with his r9600xt. works fine on my gf4, so i'd guess it's a radeon problem. as for the prod, it's surprisingly stylish for being a modern cracktro. not perfect, but good enough. Looking at the screenshot, I thought "What a bunch of crap". But the logo was actually nice, the music was nice, the overall layout likewise. But really.. isn't this intro by TRSI? Code: But really.. isn't this intro by TRSI? 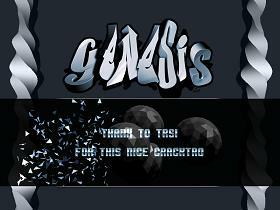 Yeah, we made it for Genesis. The font sux but the rest is cool. that geospheres look much like golf balls. i think thats because of lightitng. well quite simple but extremely stylish !